Daily Motivational Expression. Scroll down to view today's word. Oppression is a man made derivative. Cruelness brought on by thinking one is superior then the other. Some of this behavior can be found in the bible. 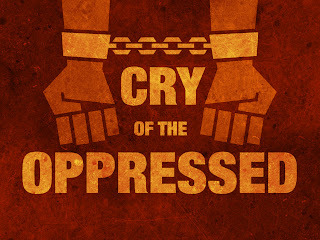 The Jewish people were oppressed. Common man or gentiles were oppressed. In today's world many races and class of people are oppressed. It is one of the most cruel ways to treat anyone. What makes one decide these things? A rhetorical question of course. Why is the world not perfect? And if there is a God why does he allow such things to take place? From day one, man/woman were given a choice. God or the world. We see the result of the choice(aka garden of Eden). A believer has to live in the world but not be of the world. We have to do our very best to live up to Gods order. Those that don't will be judged for their behavior. And know God is working behind the scenes always. Are We Equip To Slay The Giant? In The Face Of Adversity, To Whom Do You Run? What's A Mother To Do? How Do You Dance With The Devil? What Does It Take For You To Know God?